Scouting the Trade Market: Nathan Eovaldi returns? This may read as a bit of déjà vu, for the simple fact that I wrote a staggeringly similar post this time last year. At that time, Greg Bird was on the disabled list (with his return very much up in the air), Chris Carter had been DFA’d a second time, and first base was being rotated between Ji-Man Choi, Austin Romine, and Garrett Cooper. That would change with the acquisition of Todd Frazier – who was discussed as a trade target – which forced Chase Headley over to first. And the problem was (mostly) solved. Today, the problem is a bit different. Bird is (probably) healthy, but he’s simply not performing at a level that is acceptable for a first baseman. As of this writing he is batting .207/.322/.421 with a 103 wRC+, which places him 30th among first baseman with at least 100 plate appearances this year – and that’s not what you want from a position with such a high baseline for offense; especially when that player is a left-handed power bat in a righty-heavy lineup. Will the Nationals sell? It seems a bit doubtful, considering their payroll, talent level, and proximity to the playoff race – but Bryce Harper, Daniel Murphy, Gio Gonzalez, Kelvin Herrera, and Ryan Madson will all be free agents at season’s end, and Max Scherzer will be 34 in a few weeks, so it could make sense. They may need to reevaluate sooner rather than later. And, as a team with several holes, moving one of their two walk year first basemen (Reynolds being the other) could make sense. Adams is currently slashing .290/.362/.557, good for a 146 wRC+, and he has 13 HR in just 196 PA. He’s generally ineffective against lefties (career 62 wRC+), so he’s been platooned more often than not in his career – but that’s not really a problem when you can hit righties like he does (career 127 wRC+, and a 157 wRC+ this year). And having Brandon Drury and/or Tyler Austin around makes a platoon more palatable. It is worth noting that Adams hasn’t been a portrait of health. He missed about three weeks with a foot injury this year, and has dealt with knee, quadriceps, and hamstring injuries throughout his career. I don’t know that any of those injuries are truly nagging, but they do crop up every so often. Duda hasn’t been all that good with the Royals this year; in fact, he’s been worse than Bird, with a .240/.303/.410 line that translates to a 94 wRC+. He also has a disconcerting injury history of his own, including a six-week stint on the DL that ran from mid-May through late-June. And he’s hitting .200/.268/.440 since returning. As was the case with Adams, Duda is probably best utilized in a platoon. He has a 120 wRC+ against righties this year, and a 132 for his career; those numbers are 35 and 80, respectively, against southpaws. Freese is basically an offensive metronome, posting a wRC+ between 100 and 108 in each of the previous five seasons. He’s currently batting .264/.321/.410 (97 wRC+), and has been splitting his time between first and third when he’s in the field. And he’s passable at both positions, giving him a nice bit of genuine versatility. That being said, Freese is a right-handed hitter, and not a legitimate power threat, so his fit isn’t ideal. Let’s get this out of the way: Morrison is kind of a dolt. He complained about Sanchez’s inclusion in the Home Run Derby last year, and he was rightfully mocked for it. In an ideal world, that’d be water under the bridge. Unfortunately, Morrison has followed-up his breakout 2017 with a horrific 2018. He’s batting .193/.288/.359 with 10 HR (78 wRC+) in 295 PA, and that doesn’t move the needle at all. It wasn’t all that long ago that some Yankees fans were wondering if Moustakas could end up in pinstripes. They were in need of a third baseman and left-handed power, both of which fit their needs at the time, and his market was practically non-existent, which may’ve fit their budget. Moustakas ended up staying put, though, for the bargain basement prices of $5.5 MM. Moustakas is currently batting .251/.306/.460 (104 wRC+), with 17 HR in 372 PA. That’s basically right in-line with his 2017, albeit with a bit less power, and is probably a reasonable expectation going forward. His glove at first is a question mark, as he only has 35 innings there as a professional, all of which have come this year. Moustakas is a solid defender at third, though, so it stands to reason that he’d be more than fine at the easier position. Reynolds spent about two months in pinstripes back in 2013, when he slashed .236/.300/.455 (106 wRC+) in 120 PA. That’s a fairly good summary of his career as a whole, though for whatever reason he stopped walking with the Yankees – his career BB% is 11.3% (10.3% in 2018), as compared to 6.7% in the Bronx. But I digress. 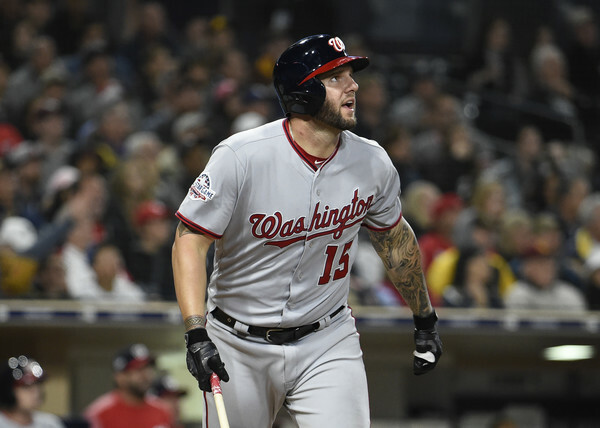 He’s currently tearing the cover off the ball for the Nationals, slashing .297/.370/.595 (155 wRC+) with 10 HR in 127 PA. Reynolds has worked as the short side of a platoon with Adams for much of this year, but he’s actually been better against righties (165 wRC+) than lefties (140). He’s also played a bit of third base (12.2 innings) for the first time since 2015. Reynolds may not be a lefty, but he has the sort of power that plays anywhere. Valencia has played third base more than anything else so far this year, but he was the Mariners first baseman for most of 2017. He’s hitting .252/.314/.431 (99 wRC+), which is fairly close to his .256/.314/.411 line (95 wRC+) from last season. And that’s pretty much who he is as a player. He walks at an average-ish rate, has average-ish pop, and strikes out at an average-ish rate. He also can’t really hit righties, as evidenced by his career 84 wRC+ against same-handed pitchers. That’s not going to cut it. Adams would make the most sense, as a lefty that’s appreciably better than Bird, but I don’t know what the Nationals will do. Beyond him, Duda, Morrison, and Moustakas aren’t clear upgrades offensively, and Freese, Reynolds, and Valencia might not be better than in-house options like Austin or Drury. If the Yankees are going to make a move for a first baseman, it seems as though the rental market isn’t the place to go for an upgrade. And looking through these players makes me feel at least marginally better about Bird’s lack of production.